In response to stress, the transcription factor p53 rapidly accumulates in the nucleus, regulating gene expression to regulate cell fate. Beyond its well-known roles as a tumour suppressor, p53 is more largely involved in the regulation of a large panel of biological responses . Several studies have underlined the interplay between influenza viruses and different signaling pathways, notably the apoptotic pathways. Interestingly, the interplay between influenza viruses and p53 has only been reported in a limited number of studies [2,3,4,5], mainly focused on the antiviral facet of p53. However, the mechanisms underlying this activity are still poorly characterized. Possible mechanisms for abrogation of the p53 response, described for many other non-oncogenic viruses (e.g. Paramyxoviruses, Poxviruses, Bornaviruses) have to be deciphered for influenza viruses. In this way, we first reported that influenza infection is associated with a global down-regulation of signaling cascades both upstream and downstream the transcription factor p53. Our study has highlighted the p53 pathway as an important player in influenza replicative cycle . Our investigations have shown that infection differentially modulates the expression of p53 isoforms Δ133p53 and p53 at both transcriptional and post-transcriptional levels. Reciprocally, we have revealed that the modulation of Δ133p53 and p53 isoforms play distinct roles in the viral cycle by acting as regulators of the p53-dependent antiviral activity . Interestingly, similar results were recently obtained by other groups with different pathogen models, and we proposed a preliminary model in which the isoforms act as regulators of the p53-mediated cellular response against pathogens infection . The main objectives of FluGuard project, based on these previously published results, are: (i) To better characterize the functional interactions between influenza viruses and the p53 pathway, with a particular focus on the multiple levels of regulation of p53 transcriptional activity. (ii) To identify, within the p53 response to infection, key viral/cellular factors involved in the antiviral response. In addition to the fundamental interest of this work, the aim of this project is to propose new host-orientated intervention strategies, for the development of future applications in the fields of antivirals and vaccine production. This project is closely connected with all the other virus-host interactions & omics approaches of the team. (i)Characterization of mechanisms underlying the regulation of p53 antiviral activity by p53 isoforms. This part of the project aims to identify (a) the cellular and viral determinants involved in the modulation of p53 isoforms expression, including splicing, during the time course of influenza infection and (b) the biological responses involved and their impact on viral production. These approaches will advantageously benefit from a large panel of tools already available in the team (large collection of influenza strains, reverse genetic systems) and the continuing collaboration with the team of Dr Jean-Christophe Bourdon (University of Dundee, UK). (ii)Study of the p53 “regulome” of the influenza infected cell: combination of classic virology with omics approaches.This part of the project aims to use an integrative biology approach to generate an accurate “snapshot” of p53 post-traductional modifications, transcriptional activity and its associated protein network in influenza infected cells. The combination of all these approaches is necessary to fully apprehend the interplay between influenza virus and the transcription factor p53, in a complementary way to the other part of the project. Beyond its fundamental interest, this integrative approach will point cellular factors of interest for the development of future pro/antiviral strategies. 1. Vousden KH et al., Blinded by the Light: The Growing Complexity of p53, Cell., 2009. 2. 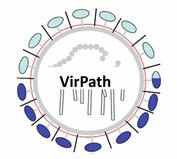 Rivas C et al., Dual Role of p53 in Innate Antiviral Immunity , Viruses, 2010. 3. Zhirnov OP & Klenk HD, Control of apoptosis in influenza virus-infected cells by up-regulation of Akt and p53 signaling, Apoptosis, 2007. 4. Muñoz-Fontela C et al., Transcriptional role of p53 in interferon-mediated antiviral immunity, J Exp Med., 2008. 5. Muñoz-Fontela C et al., Acetylation is indispensable for p53 antiviral activity, Cell Cycle, 2011. 6. Terrier O et al., Cellular transcriptional profiling in human lung epithelial cells infected by different subtypes of influenza A viruses reveals an overall down-regulation of the host p53 pathway, Virol J., 2011. 7. Terrier O et al., Influenza A viruses control expression of proviral human p53 isoforms p53β and Delta133p53α, J Virol., 2012. 8. Terrier O et al., p53 protein isoforms: key regulators in the front line of pathogen infections?, PLoS Pathog., 2013.